Bethesda will once again host a press conference at E3 alongside the likes of Sony and Microsoft. Last year, Bethesda decided to hold a big E3 press conference, like Sony, Microsoft and Ubisoft had done in the past (and even Nintendo before the Nintendo Direct days). Most of us had assumed it was a one-off thing to hype the crap out of the soon-to-be-released Fallout 4 but today Bethesda has announced that it will once again hold a conference. 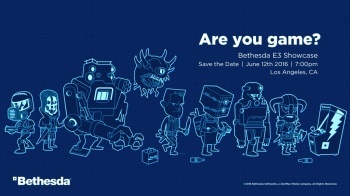 Bethesda announced the press conference over Twitter, stating that an E3 games showcase would take place in Los Angeles on June 12, the Sunday before E3 begins in proper. An image accompanied the Tweet, showing characters from all of Bethesda's franchises. Bethesda frontman Pete Hines told The Telegraph last year that "I don't know if we'll do one again," in regards to this showcase. So what can we expect from Bethesda's conference? Since Fallout 4 is already out, we should hopefully hear news about the Season Pass Bethesda has been rather quiet on. Doom should hopefully be out by then, so we won't get too much hyping about that. We should also get some news about Dishonored 2.